Within Teamwork Projects, you can copy a notebook or move it to another project. Note: You will need to have the can add/edit notebooks permission, or be a project/site administrator to be able to do this. In the Notebooks section of your project, select to open the notebook you want to copy/move. When viewing the notebook, click the options (three dots) button in the top right corner, and select Move or Copy Notebook from the dropdown menu. In the copy/move modal, you can choose whether you want to move or copy, as well as the destination project. You can save the copy of the notebook to the existing project, or to a different one. 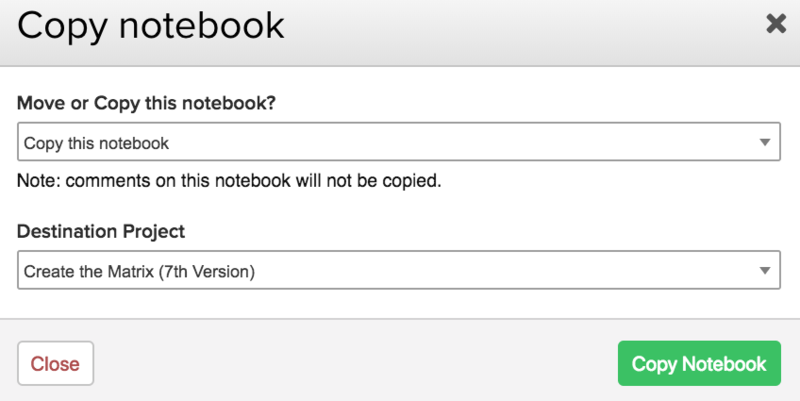 Note: When copying notebooks, any comments on the notebook will not be copied.